Winter pro: I learned how to use our snow blower this year and am pushing and dragging that thing around like a winter warrior. Winter con: there is so much freakin’ snow outside my house you can’t even see me behind the damn mountain of it. Granted, I’m short (coming in at a generous 5 foot 2 inches) but our mountain of snow is so tall it even obscures my brother who’s 6 feet tall! It’s been a loooong time since I’ve experienced a winter like this. And this is coming from a girl who was born and bred in Canada and would lay in the snow inside a snow fort as a kid and just look up at the sky without a care in the world. What can I say? We’ve been a little spoiled the last few years here in Toronto so being slapped with so much snow and such bitterly cold temperatures all at once week after week has taken a bit of getting used to. And I’ll be honest, it’s been especially stymying for me generating blog content. I’ve never cancelled and switched around my plans more than I have this winter and the cold weather has really pushed me to get creative with the logistics of my outings. I don’t fare so well in extreme temperatures (hot or cold) as both give me bad migraines so at any given moment I need to hop indoors to warm up to keep myself from being exposed for long periods of time. Thus, the cold weather has, unfortunately, prevented me from taking those long exploration walks around the city that I love so much, relegating me to the more retail-oriented parts of town. Which is not necessarily a bad thing! But let’s be frank: malls get boring real fast and they do me no favours in the food blogging department. And you all know how much I thrive on variety! So I’ve had to put my thinking cap on and figure out how to go about taking photos and trying new places still staying relatively close to the indoors and I think I’ve come up with a few pretty good solutions for myself. 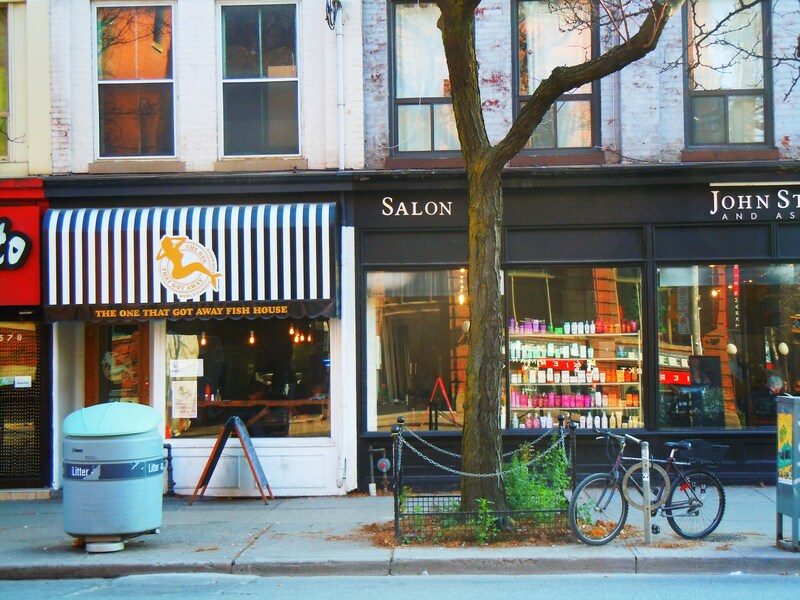 One such outing led me through the underground PATH downtown (which is one of my favourite things in the city) through the Sun Life financial building and straight into the warm and welcoming arms of Earls Kitchen & Bar on King Street West and York Street. Who would have thought I’d be walking through an insurance building to do food blogging! Earls Kitchen & Bar is a place I’ve been meaning to try for years and while having a case of cabin fever isn’t exactly the best reason for finally going, I’ll take it. Because it’s a wonderful place and a place I’d be happy to go back to for meals and meals to come. If you haven’t been, make the effort because the food is delicious, the staff is so friendly and accommodating, and the restaurant is beautiful and lovely inside. 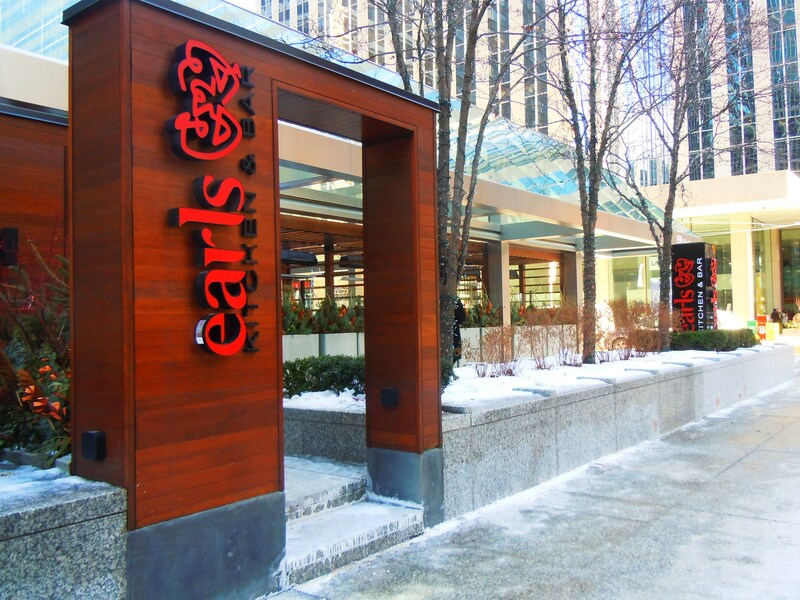 Located at 150 King Street West in the financial district hubbub, Earls has a gorgeous outdoor patio out front (which I will be sure to enjoy come summer!) and two large dining areas inside including the large bar and adjoining dining room, making it quite the haunt for the business lunch crowd. 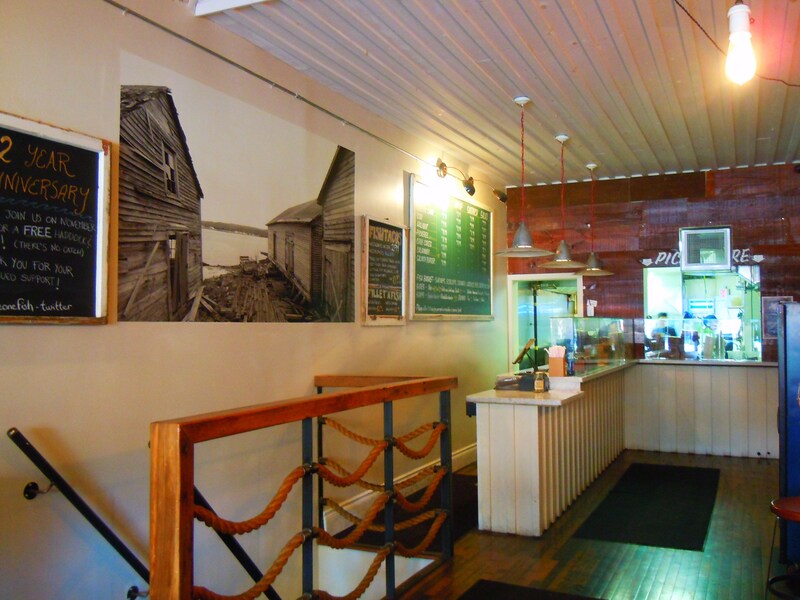 The dining room makes you feel like you’re eating inside a log cabin. It’s so warm and cozy and nice. And their menu has warm and cozy written all over it. While it offers lots of pub fare such as appetizers (calamari, prawn and mango rolls, dry ribs, chicken and wontons), burgers, tacos and sandwiches (angus beef on brioche, chicken tacos, chicken with brie and fig on ciabatta, roasted portobellini and red pepper on sourdough), it offers just as many dishes that will warm you all over on a cold winter’s day such as meaty steaks and seafood, ribs and chicken, roasted root vegetables, curry and pasta (I’ve heard fantastic things about their fettuccini!) and what I had for lunch: sourdough, soup and salad! Their chicken and field mushroom fettuccini was calling out at me like a foghorn but I really wanted to try something more lunch fare-ish and I don’t post nearly enough about soup so I jumped at the chance to try Earls salad, soup and sourdough meal ($13.75). 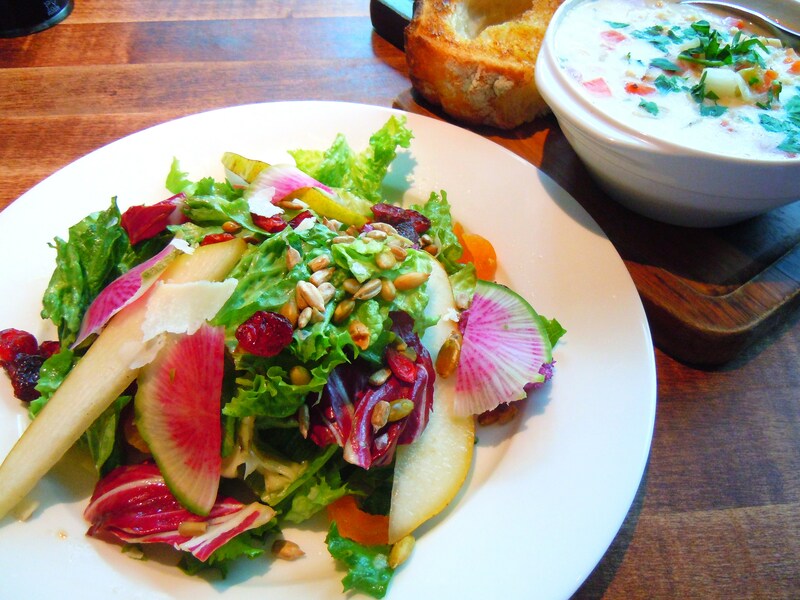 The meal comes with your choice of Caesar or Harvest salad, Earls Famous Clam Chowder or featured soup (which was cream of mushroom at the time), and sourdough bread. 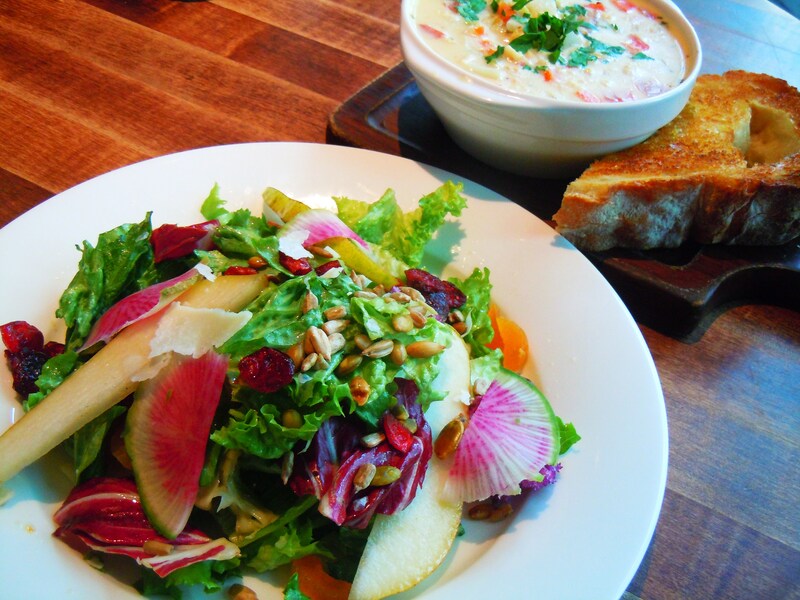 What better way to celebrate the season than with harvest salad and cozy clam chowder?! Earls’ Harvest Crunch salad is a beautiful, bright and refreshing mix of baby greens, purple kale, watermelon radish (possibly the prettiest vegetable to grace the earth), sunflower seeds, slices of pear (which I sadly couldn’t eat because of my allergy but it was lovely to look at nevertheless and thankfully there weren’t too many slices so I didn’t have to feel awful for leaving them on my plate) and dried fruit (apricots and cranberries) dressed in citrus vinaigrette with shaved parmesan. 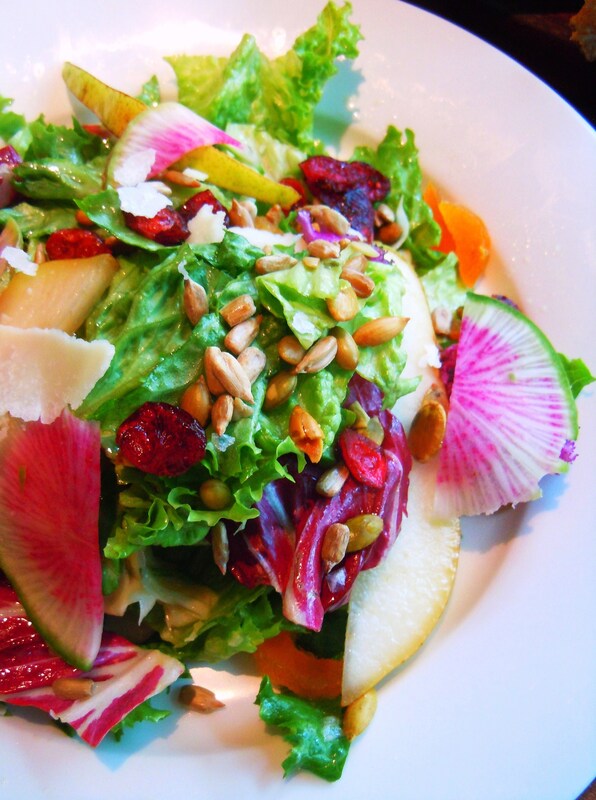 I was all over it like peanut butter on jelly – I hardly ever see watermelon radish in salad! 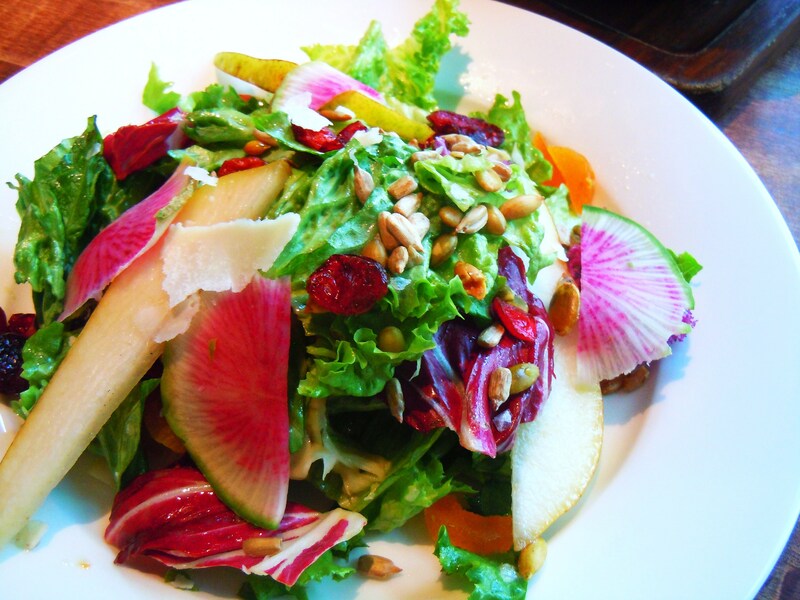 I love crunch and texture in my salads and the fruit, seeds and radishes made it so enjoyable to eat, not to mention the parmesan gave the salad that yummy hit of saltiness, balancing out the sweetness from the dressing and fruits. It was a such fab presentation of the winter bounty in salad form. And the clam chowder and sourdough bread. 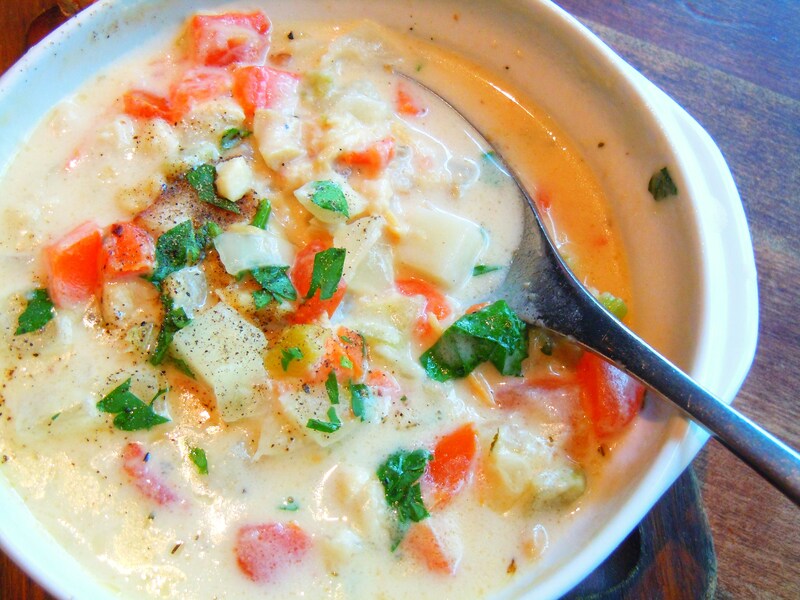 You will never look at clam chowder and sourdough the same way again after you have it here at Earls. For starters, it was presented beautifully on a wooden serving board. 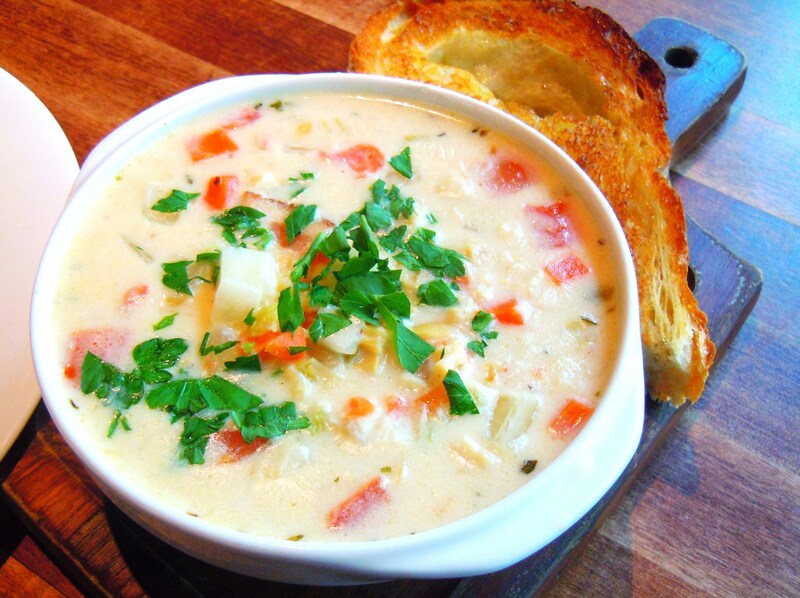 Second, the clam chowder was hearty and scrumptious, chock full of diced tomatoes, celery, carrots, potatoes and meaty clams in a smooth and creamy broth sprinkled with freshly chopped parsley. 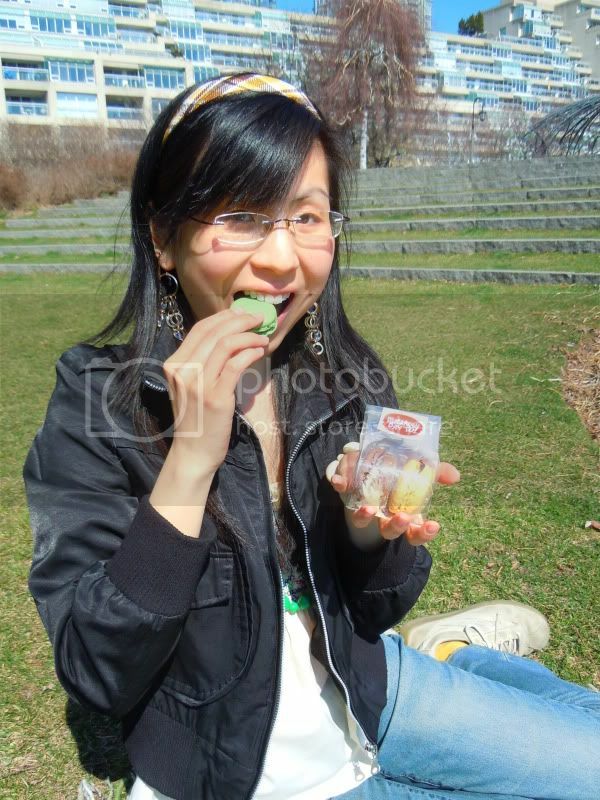 It filled me without making me feel like I ate something too creamy or too saturated. It was just SO DARN DELICIOUS. It was so full of substance and it ate like a meal, pairing beautifully with the sourdough bread beside it. The gigantic wedge of sourdough knocked it out of the park. It was golden to perfection with a crunchy crust on the outside, a moist and buttery inside and this amazing sweetness from the little bit of honey that was drizzled over top. I couldn’t believe my tastebuds. I sat there chewing on my sourdough thinking, “what the heck is this delicious taste that I am tasting? !” It was sweet and light and unlike any sourdough I had ever had and then it dawned on me that there was a bit of honey on it. 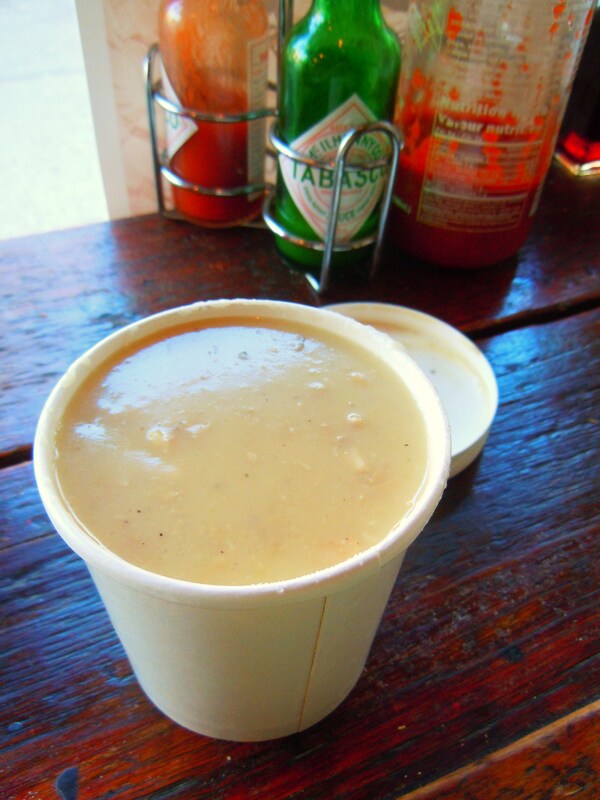 It was fabulous on its own and as a dunker for the clam chowder. 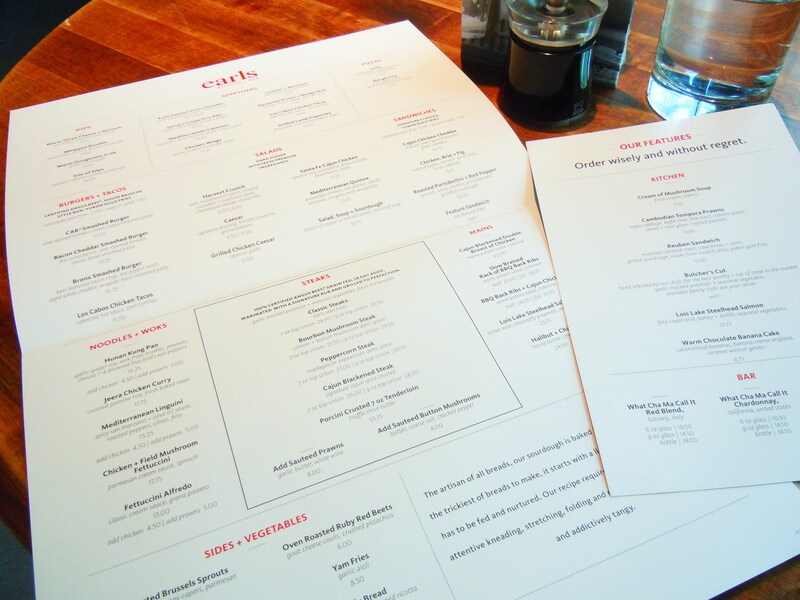 This first visit to Earls made me feel all warm and fuzzy inside for more reasons than one and I’d love to go back to try at least ten other dishes! Given how winter isn’t going away any time soon, I just might take advantage of the cold and make a return trip before the season is over for more winter comfort eats. 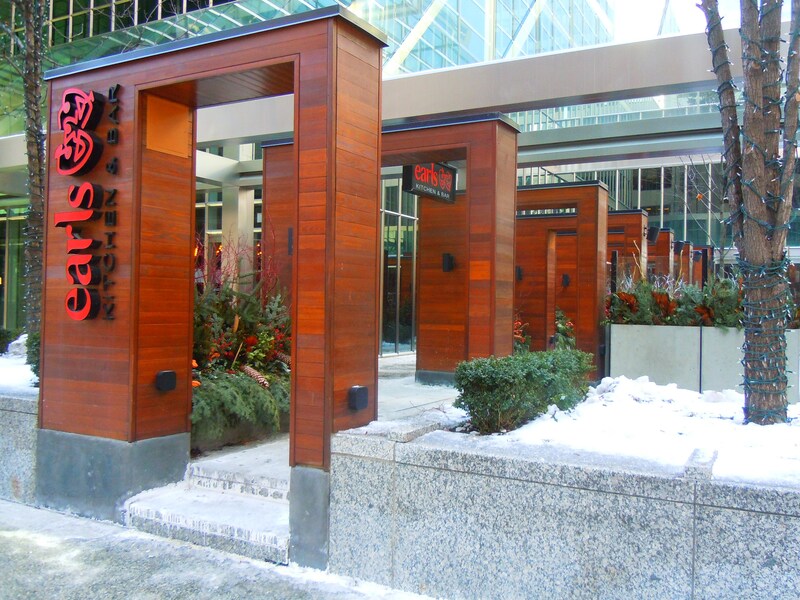 Earls Kitchen & Bar is located at 150 King Street West at York Street in the financial district in downtown Toronto. They are open 7 days a week at 11:30am Monday through Sunday, with weekend brunch service on Saturdays and Sundays. 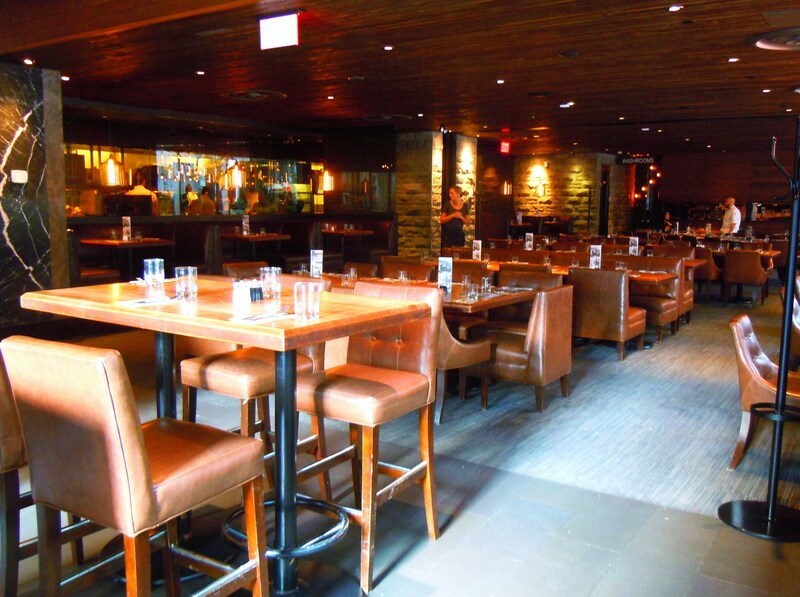 Earls Kitchen & Bar serves multiple locations in the GTA and across the country. 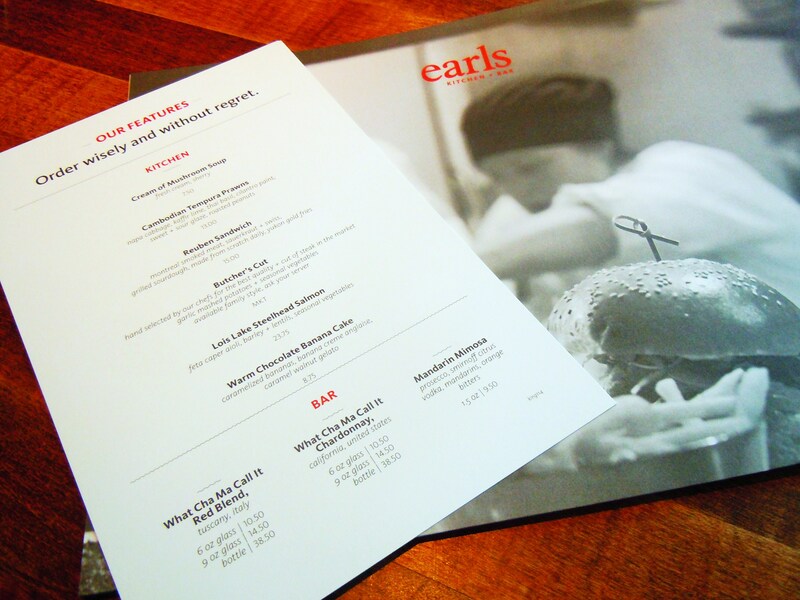 Visit their website at http://www.earls.ca/ for more info on their menus and locations. 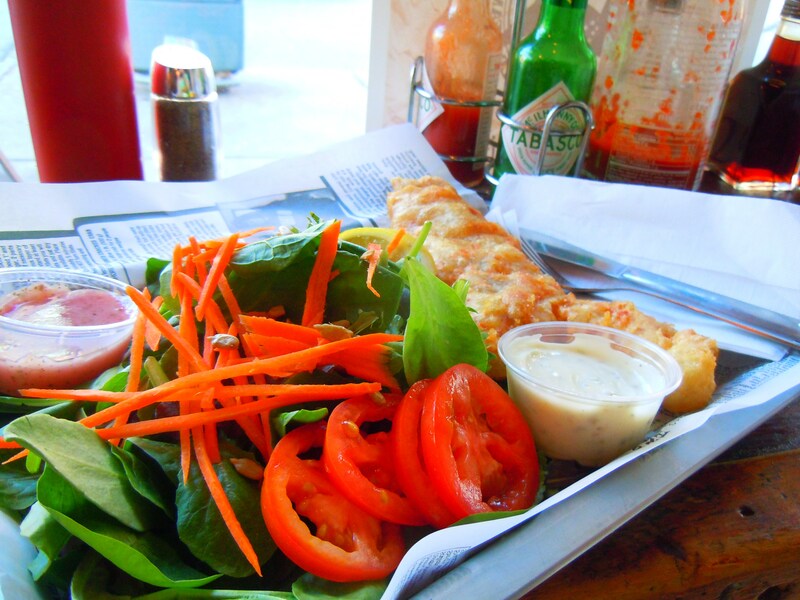 Hooked on Buttery, Crunchy Fish n’ Chips, Grilled Fish & Salad and More – The One That Got Away Fish House on King West! The creamy, tangy taste of tartar sauce, the moist flakiness of fresh fish, and the delightful, delicious crunch of hot crispy batter straight out of the fryer – ah, the tastes of fish n’ chips, melting in your mouth. I LOVE fish n’ chips. Out of all the different types of classic pub fare out there, fish n’ chips is my ultimate favourite. I don’t have it often. Twice a year at best. But when I do? Heaven on earth. And believe it or not, amazing fish n’ chips places are hard to find simply because not all fries are created equal (and I think I can speak for everyone when I say that we’ve all had a less than stellar experience with subpar French fries at least once in our life) and some places just aren’t very, well, scenic. I know we’re eating pub fare and all but I’d like to feel at least somewhat comfortable in a space that doesn’t look like a janitorial closet married a cheap take-out joint. Lucky for me, I’ve had some fab experiences with great fish n’ chips and battered fish dishes in and around the city including my personal favourites, King’s Table on Queen East in the Beaches and Jakes Pub & Grille in Markham on Main Street Unionville. The latest addition to the list? The One That Got Away Fish House on King Street West! Even though I’m introducing The One That Got Away for the first time on Ate by Ate, the fish house and I go much further back. Over a year back. Which actually isn’t that long ago, but you get the point. I have such fond memories of my first few meals from here simply because I had them in the company of my fellow icing sugar queens during my time at Le Dolci! The old studio was literally just around the corner off of King West and Portland Street so every now and then Lisa, Miya, and momma Dolci Linda (and later Irina) and I would grab some delicious fish n’ chips and fish meals from here for lunch. I still remember the very first time I had fish from The One That Got Away. It was my first day at the studio and the decision on what to eat for lunch was unanimous: fish! We all ordered fresh grilled fish wraps with a side order of chips (fries) and thus began a beautiful friendship and journey, not just with the fish house, but with Lisa and Miya and the studio itself. We had fun eating, talking, and trying very hard not to dribble fish sauce down ourselves. It simaltaneously feels like yesterday and light years ago. They were happy memories though and that has what has kept me coming back. The One That Got Away Fish House is such a seafood, fish n’ chips powerhouse. 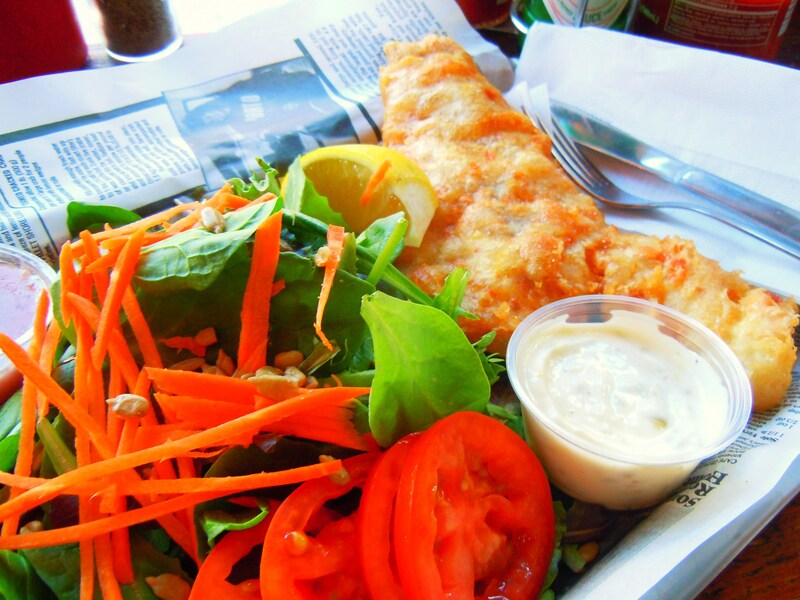 Not only do they offer a number of battered fish n’ chips options (haddock, cod, halibut, arctic char, and pickerel), they also offer all of those types of fish in grilled form! Battered fish, grilled fish…battered fish, grilled fish…I know, it’s a hard decision to make at times. And to add to the indecision, let’s throw in salmon burgers, fish tacos, seafood chowder, Manhattan chowder, fish and seafood baskets, fish wraps, fish sandwiches, fish and salads, calamari, and crab cakes. Have I made you salivate yet? Because I sure am. Their menu is fantastic! 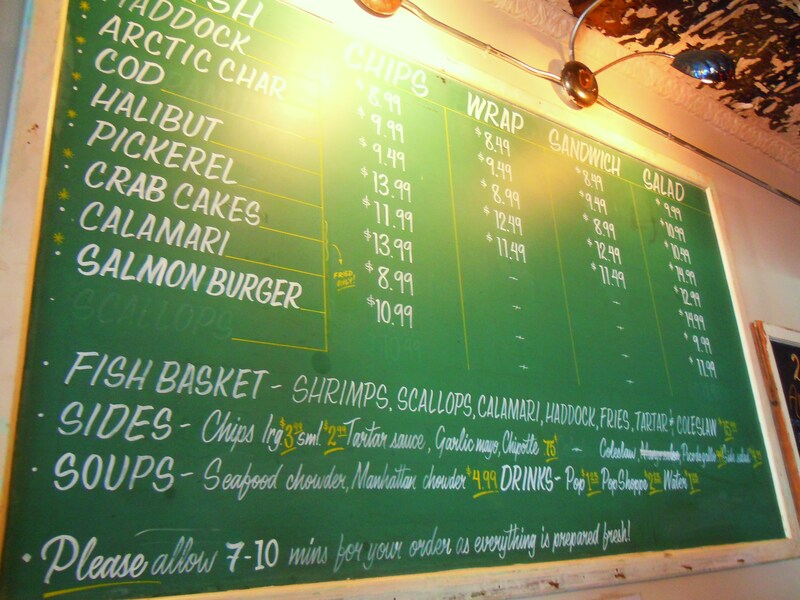 And prices are pretty average for fish n’ chips and pretty on par with other spots more or less. 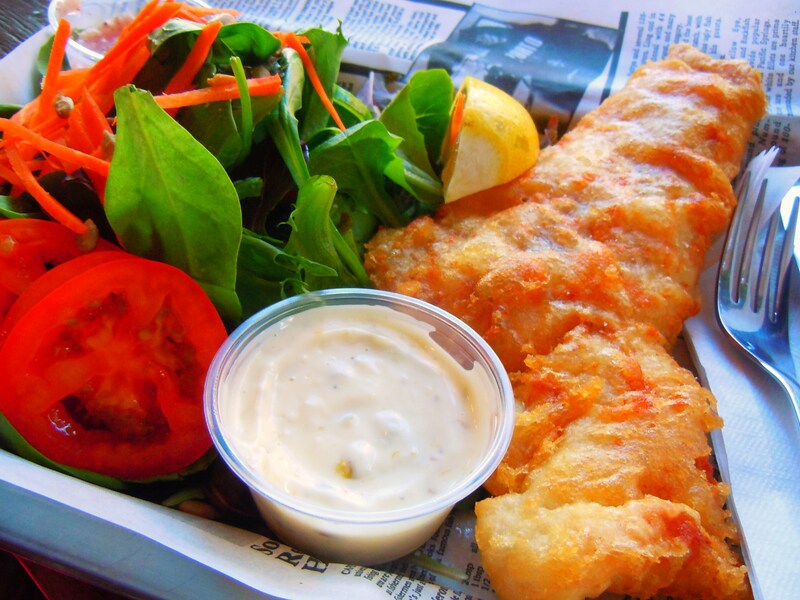 Prices for battered fish n’ chips range from $8.99-$13.99, fish wraps, tacos, and sandwiches are $8.49-$12.49, fish with salads are $9.99-$14.99, and chowders and soups come in at $4.99. 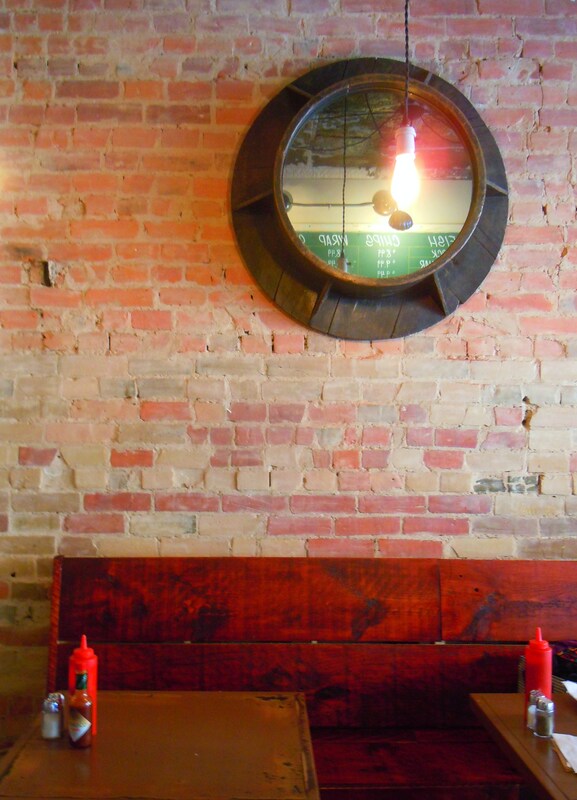 It’s a small space, but I enjoy eating here because the people are really friendly and hey, the exposed brick walls have submarine windows on them giving them a cute aquatic feel! The meals are presented on silver trays covered with cute printed wax paper made to look like fish stories on newspaper. The quality of food is absolutely fantastic. 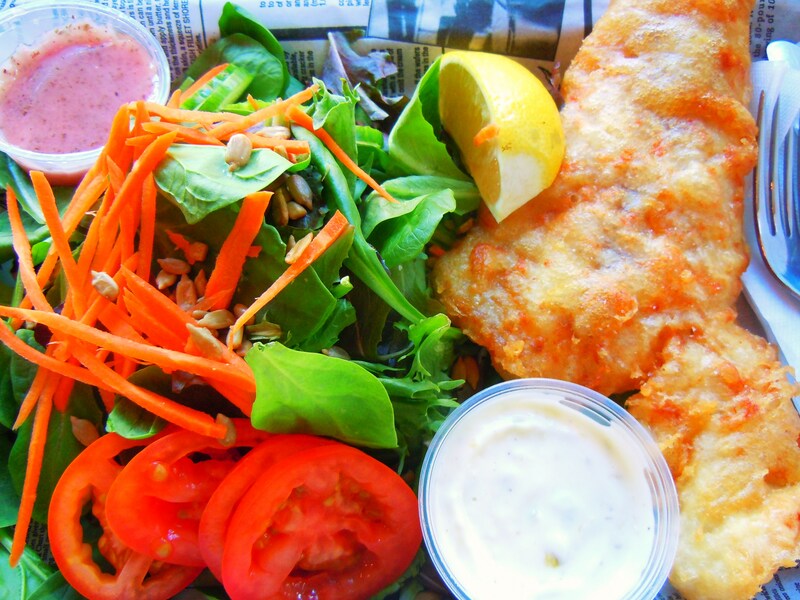 The fish is flaky and moist, the batter is crunchy, crispy, light, and buttery, and it’s always accompanied with great salad or fries. I know everyone has their own personal preferences when it comes to fries (level of saltiness, crispy vs. mushier, beefy wedges vs. shoestring, and so on) but I love their fries simply because they’re never dry or too starchy and I just love the texture and softness, not to mention the herbs and flavour. 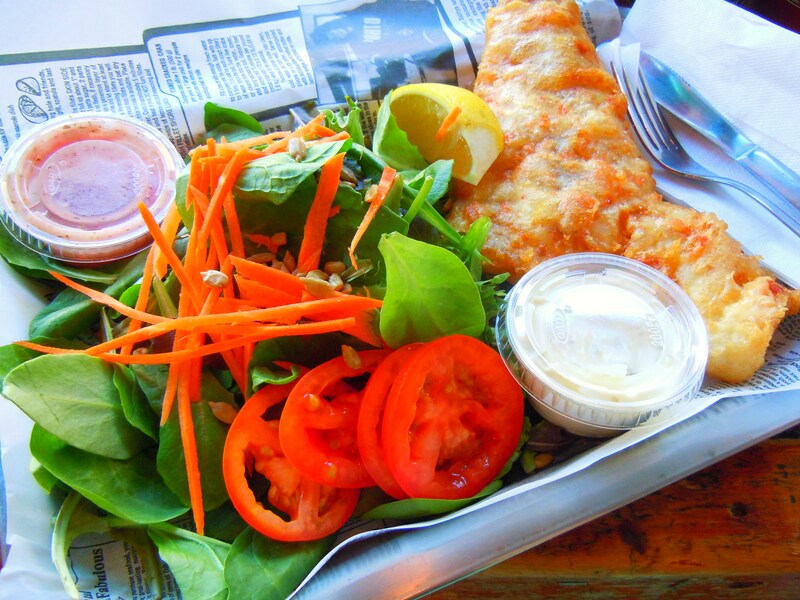 I’ve had their battered fish with salad (pictured in the photos; battered haddock with salad), grilled fish with salad, battered fish in a sandwich, grilled fish in a wrap, and their seafood chowder and I love them all. If I had to choose my favourites though I’d have to say that the fish sandwiches are great bang for your buck (these things are HUGE! They’re like fish subs), the seafood chowder has so much warmth and flavour, not to mention potatoes and chunky seafood (if you love a hearty, chunky chowder, you’ll be head over heels over it), and the grilled fish with salad is a wonderful, healthy alternative to the battered fish. I know, I haven’t really narrowed it down to the best of the best but that’s only because it’s all so scrumptious and delicious! They change up their salads every once in awhile (there are always mixed greens, tomatoes, shredded carrots and sunflower seeds but every so often there will also be yellow beets and other veggies mixed in) and I love the fact that you can choose whether you want battered OR grilled fish. Oh! And if you love sauce like I do, you absolutely MUST get your hands and tastebuds on their spicy chipotle mayo and seafood sauce. HOLY MOTHER OF PEARL. Hands down one of the best sauces EVER. It’s spicy with kick, it’s creamy, it’s savoury, and it is just yummy beyond comprehension. There’s so much more I want to try – pickerel, fish tacos, a fish basket, and more – so this first post on The One That Got Away is just the beginning! 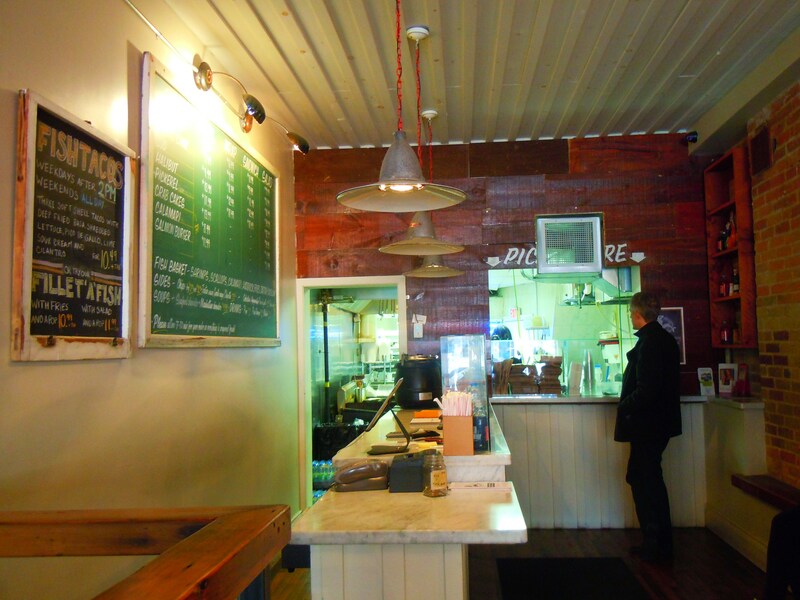 The One That Got Away Fish House is located at 581 King Street West at the corner of King and Portland Street. They are open 7 days a week: Monday to Friday 11am-10pm, Saturday 12pm-10pm, and Sunday 12pm-7pm. You can visit their website HERE for more info.